After meeting his euro zone counterparts in Brussels, Finance Minister Euclid Tsakalotos said that last year's primary surplus - which excludes debt servicing costs - reached 2 percent of gross domestic product, beating a target of 0.5 percent of GDP set in its bailout plan. A Greek government official said earlier that due to this over-performance Athens was "making a much better start in 2017" in terms of state revenues. Greece's progress was discussed at the so-called Eurogroup meeting, which urged both Athens and its creditors to resume negotiations and reach an agreement on the review. The leftist-led government, which signed up to a new bailout program in 2015, wants to conclude the review swiftly to join the European Central Bank's bond buying program, which would cut its borrowing costs. It also wants to return to bond markets by the end of 2017, one year before its rescue program ends. But the EU and the International Monetary Fund are at odds over Greece's targets after 2018, and the disagreements have rekindled fears of a new crisis in the country. Despite EU assurances, the IMF, which has yet to decide whether it will participate in Greece's third rescue program, says Athens will not achieve a 3.5 percent of GDP target in the medium-term - a period which has yet to be defined - unless it adopts more austerity measures and is granted more debt relief. The Greek government which is sagging in opinion polls, says it will not pass any more revenue-raising measures beyond what has been agreed in its bailout package. IMF spokesman William Murray said earlier on Thursday that the fund's view on Greece had not changed. "If Greece and its European partners decide on a higher primary surplus (target) for a temporary period, we would need to evaluate the policies that could credibly support that target," he said. Tsakalotos urged the IMF to review its stance following Greece's over-performance, which he said shows that Athens does not need to take new measures to meet its targets. Greece must achieve a primary surplus of 1.75 percent of GDP this year and a 3.5 percent of GDP surplus in 2018. Although Athens does not face large repayments until the third quarter, the completion of the review is important to keep up reform momentum and projections of a strong return to growth. "A further delay in the (review) negotiations ... beyond the first quarter, must be avoided since it could put the 2016 positive momentum at risk," National Bank economist Nikos Magginas said. 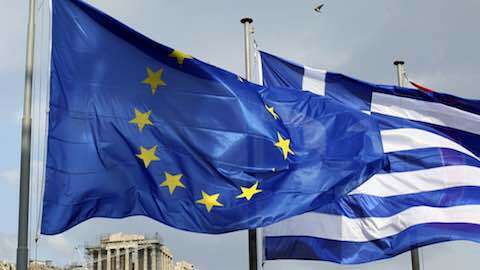 Europe: "Greece Hopes Lenders Will Drop Austerity Demands"